1. Awesome! I’ve always wanted to try haggis. 2. By the way, what’s Burns Night? 3. And while I’m asking…what, exactly, is haggis? 4. 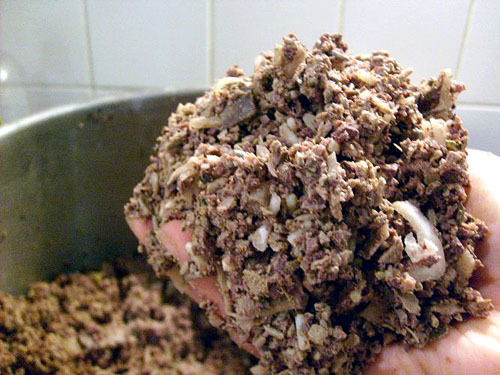 A sheep heart, lung, and liver minced and mixed with oatmeal and onions and stuffed inside a sheep stomach? <gulp> We are definitely going to need that whiskey. Haggis, to most ignorant Americans like myself, is one of those iconic Scottish associations like kilts, bagpipes, and Mel Gibson covered in blue facepaint and exuding a throaty roar for ‘FREEEEDOOOM!’ We might have heard of it but almost certainly wouldn’t be able to say what it’s made of, only that it has something to do with terrifying animal parts and probably shouldn’t ever be consumed until after seven shots of Scotch. Well, let me set the record straight on two fronts. 1. As much as you may love William Wallace in a skirt, kilts weren’t invented for another three centuries (one of the many twists of truth contributing to Braveheart being second on a list of ‘most historically inaccurate’ movies ever made). 2. Haggis is, shockingly, absolutely delicious. However, it took quite a long time and a lot of work to get it to that point. And I’ll be honest, there was a fair amount of grimacing, gagging, nose-holding, and are-we-really-serving-this-to-paying-customers?-questioning along the way. It all started with my haggis-making partner-in-crime, foodrambler, hunting in vain and then finally securing three lamb’s plucks – the windpipe, heart, lungs and liver – for our haggis adventure. Following this recipe from the Guardian by Tim Hayward, she began the adventure the previous evening by cutting out the windpipes (blecch), boiling the plucks for several hours then leaving them to cool overnight in the murky cooking liquid.